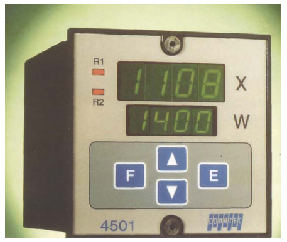 Temperature regulator set-up by keyboard designed for all processes which require actions on contactors, servovalves without feedback and continuous outputs. PID or ON/OFF control with adjustable hysteresis. - Analogue signal 0-20 mA, 4-20 mA, 0-10v or 2-10 v.
- Relay for servo-motor without feedback. Absolute, relative or band configurable alarm for the control outputs relay and analogic.